LAIR OF EVIL, Conseil Européen pour la Recherche Nucléaire, Friday (NNGadget) — Dr Evil’s plans to destroy the earth have come ever-closer, with the construction of a Large Hadron Collider in a secret location in Switzerland. 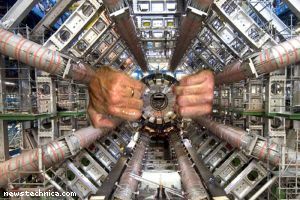 Dr Evil’s Large Hadron Collider threatens such fates as the destruction of the Universe through a recreated Big Bang, strangelets converting all normal matter, wormholes in space and time or the possible creation of the World Wide Web. The citizenry of the world have risen in protest, with lawyers, psychologists and other persons highly versed in particle physics attempting to stop the device through the courts. This is attributed to the accidental creation of a strange moron particle, which spreads through the world turning everyone it encounters into more strange morons. I got so distracted by the photo that I couldn’t finish reading the post. I see technogoatse and it makes me a little hot in a twisted geeky kinda way. Too funny! We were just talking abut this super collider the other day and wondering what happens if it does create a black hole. Would anyone notice if Switzerland got sucked in? Would anyone try to pull them out again? Shame on Large Hadron Collider! Let bring army to destroy Large Hadron Collider to save millions of people now!! Go army and navy agents! Feels like I should be inserting some sort of ‘weird science’ malicious laughter… adding to yours, of course.